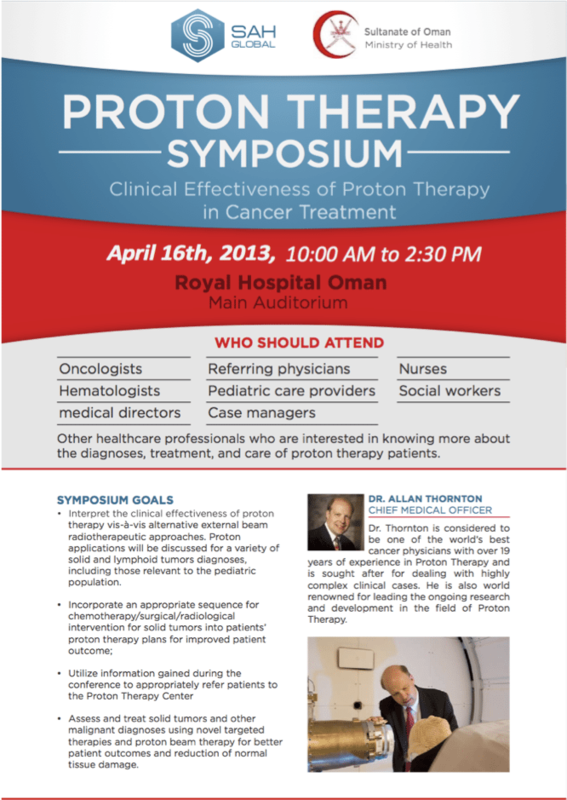 Experts from the around the world gathered at a Proton Therapy Symposium held at the Royal Hospital Oman, sponsored by SAH Global, to discuss the clinical effectiveness of proton therapy in cancer treatments. World renowned physicians and innovators in cancer treatments gathered to examine clinical advances and share knowledge in order to improve patient outcomes. The keynote speaker was one of the world’s leading oncologists, Allan Thornton, MD, who serves as the Chief Medical Officer for SAH Global. He is considered to be one the world’s best cancer physicians and a global leader in the research and development of proton therapy. Dr. Thornton is sought by leading hospitals worldwide for his expertise in highly complex clinical cancer cases.